The definition of fuzzy logic might appear as fuzzy to most, but fuzzy logic forms the basis of control parameters from your washing machine to making movies like Lord of the Rings. We are not going to look too closely at the mathematical fuzzy sets and their operations as developed by Prof. Lofti Zadeh. What we will see in this blog instead is how the concept of fuzzy logic helps us to submit more effectively to internet directories. To start with, let us chip away the theory bit from this logic and view things in a practical light. In microprocessor-controlled appliances/applications, you cannot define all variables with precise quantities all the time. You need to allocate certain parameters as dependant on other variables, which will loop back to the earlier ones. Things are not always in black and white â€“ some can come in shades of grey too. Accept this and factor in these in to your overall scheme of things. That sums up albeit briefly what the fuzzy logic is all about in simple terms. Your washing machineâ€™s microcontroller chip â€˜estimatesâ€™ the load quantity and calculates the resources (water, detergent and additives if any) based on sensors. It decides the best washing option using fuzzy logic and issues commands to electrical components accordingly. Fuzzy Logic plays a major role in computer software too. Most of the applications in real world will need to adjust to real world situations. The software must factor in unknown and unpredictable situation in order to be stable. For example, our own Athena health engine uses pattern recognition and uses past accumulated data to arrive at the essence of what the user wants. Some of the techniques and logic used in many computer algorithms are too fuzzy to be described as anything but fuzzy. Most webmasters know that getting quality IBLs (inbound links) is essential to make their sites visible in the search engines. To some extent, it also adds to the traffic as you get thematically grouped links under each category. By their own right, many niche directories offer decent amount of targeted traffic to the sites linked. Most would also know that it takes quite an investment in terms of the time needed to identify, read the guidelines, search for the right category and submit your site. However, always some who look for a quick way out of this. There is no short cut to this process of directory submission. The bottom line is the editor of the directory goes through a painful process of weeding out thousands of spam submissions every day. For a volunteer editor, this unfortunately takes away the time required for editing and adding many useful submissions. All editors of human edited directories face this problem. Targetwoman directory gets a ton of useless submissions everyday. Unfortunately, the few tens of useful, carefully submitted genuine websites are drowned out in the sea of spam. A singular solution to the long-suffering editors needed to be found and someone suggested that some fuzzy logic concept is roped in for this. So we decided to implement a bit of this into our â€˜add URLâ€™ page. The whole idea itself is a bit fuzzy. It is all based on our observation of so many thousands of spam submissions. Point No.1 – A typical spam submitter hardly ever reads the submission guidelines. Many people embed a hidden secret word somewhere in the copy of the submission guideline as is commonly done by some Awards site. But it takes more time to hunt for the word for the normal genuine submitters. Point No.2 â€“ A typical spam submitter almost always submits many URLs at the same time. So send the submission page to limbo when the page is loaded with more than one URL. Point No.3 â€“ A typical spammer types or copies and pastes several lines in the description column. Raise a red flag if such signs are detected for any other column. Point No.4 â€“ Another trick of a spammer is to type superlatives. Our guidelines strictly forbid using hyperbole or superlatives in the description. Most directories edit out your descriptions if they contain marketing hype. So raise a flag if this point is detected as well. Point No.5 â€“ Some spammers test the water by submitting gibberish at first. Good thing is check for gibberish. So we will implement all the above points in the scripts handling the directory submission as soon as we make sense of the logic which is so fuzzy. I had mentioned yesterday that I had cooked CDs and DVDs just to see the sparkle effects on them. Do NOT try them at home. It could result in serious fire hazard or permanent damage to your microwave oven. I just wanted to show you here how a DVD looks after sitting inside a microwave for only 5 seconds. The image below shows a normal “raw” uncooked DVD. Observe the random pattern burnt on the surface and the colorful effects around the burn mark. In fact you will not see any dark tell-tale burnt mark on the DVD. It is all in golden hue. This heading might raise eyebrows as is expected.Â It takes long hours of hard work to run servers and portals. Like most of you, I make do with pizzas and takeaways half the time. But the ubiquitous microwave sitting on the shelves of our office, finally induced me to spruce up some snack when I am famished. Apart from the gallons of coffee it could brew and the standard cup-of-noodles kind of snacks it could so easily deliver, it could do a whole lot of things we never imagined â€“ at least I never even imagined. The following is an exercise into the world of microwave cooking with a difference â€“ we look at all aspects â€“ technical and practical as well. Technical View: If you are one of those who think that technology is best left to techies and nerds, skip to the practical section. Let us be practical. If the required power were derived from a chopper power supply or to use the computer parlance â€“ switch mode power supply, the resulting harmonics would have inundated the spectrum.Â Still microwave ovens emit enough low level power to swamp around the 2450 MHz frequency. Many cordless phones operating out of this frequency spectrum are not too happy sitting around in the same room with a microwave. Bone-dry cloth or paper wrappers sit inside with little effect on them, as there is no water molecule to fire up. But donâ€™t put your cutleries inside a microwave as the metal implements will act as antennas to absorb the microwave energy which manifests in the form of nasty sparking. Sustained sparking and operating an empty microwave can damage the magnetron, which is the most expensive component in a microwave. Again use utensils, wrappers, glassware and containers specifically designed for microwave use inside a microwave. Some plastics disintegrate and the resulting carcinogens may leach into the food. Another issue about the microwave is its tendency to induce super heating in some foods under certain conditions, which can result in severe burns on the user. Covered soups or liquid food can burst into droplets of boiling liquid and steam when moved or handled immediately after cooking in microwave. Always let the food stay for sometime before handling them. Eggs display a tendency to explode inside a microwave. Â Let us get into the meat of the matter â€“ I mean we will see if we can make some scrumptious meal in our office microwave oven. I suggest some caveat here, as I am not so good in churning out tasty meals.Â So proceed with caution. After marinating for a few hours, the chicken pieces can be dipped in the beaten egg white and then hauled over the bowl of sesame seeds.Â Â Â Keep the chicken pieces in several layers of kitchen paper inside microwave and cook under full power for about 4 to 7 minutes. Actual time to cook may vary depending on the chicken, microwave or the power supply conditions. Check by piercing the middle of chicken piece with a fork. I have cooked a dud CD inside a microwave, in a bid to lower my frustration and at first sight, it emerged unscathed. But on closer inspection, I could see that the thin metal film layer had resulted in some sparking and localized heating melting the plastic surrounding it.Â I should not be surprised at the results. 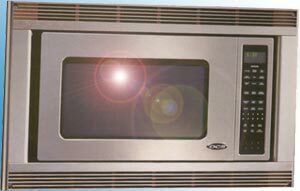 Typically, a microwave ovenâ€™s magnetron produces about 500 watts of electromagnetic energy, which must have been concentrated in the small surface of the metal layer on the CD â€“ vaporizing the metal. This is not recommended for the normal household microwave ovens. Disclaimer: The above information is provided as-is and carries no warranty express or implied about the methods or techniques explained here. The author of this Blog or the site in which this appears will not be responsible for any consequence arising out of the use of this article under any circumstances. You will be advised to read the instructions of the manufacturer of the products.